When: 10 a.m. to 9 p.m. Saturday, switching from fair to party at 6 p.m.
Where: Street fair takes over West Garland Avenue in north Spokane from Monroe to Howard streets, along with adjoining parts of Post and Wall streets. Block party takes place on Garland from Post to Monroe. Online: For a main-stage schedule and more information, go to www.garlanddistrict.com. Toto’s not on Garland anymore. The annual street fair run by the Garland Business District is veering from tradition, trading its “Wizard of Oz” theme for an emphasis on creative arts. The fair also has combined with the district’s block party, turning two days of events into one. In its 12th year, the street fair was known for “Oz” costume contests, actors roaming in character as the Cowardly Lion and the Tin Man, and little dogs dressed as flying monkeys. So there will be no Dorothy Gale impersonation contest. But there will be plenty of other opportunities for artistic expression. Children and adults can get their hands arty at painting, sewing, crafts and tie-dye booths. Photographers, jewelry makers and other artists will sell their work. Spray-can artists will demonstrate their techniques. Painters will put up a mural behind the Spokane Art School in its new Garland Avenue location. Northwest musicians will make a diversity of music – nine bands altogether will play alternative rock, acoustic blues, reggae and more – on the main stage in front of the Garland Theater, 924 W. Garland Ave. The Party Enchantments – princesses who sing and tell stories – will take the stage twice. The fair’s first farmers market will comprise about a dozen sellers, and food vendors will do the cooking. The festivities will culminate with an 8 p.m. Runway Renegades fashion show, highlighting the work of six teams of fashion designers, makeup artists, hairstylists, jewelry designers, photographers and models. The Garland District began to take shape in the 1920s, according to a history on its website. Now the district has 85 member businesses, including spots to eat and drink, clothing and thrift stores, theaters and service agencies. 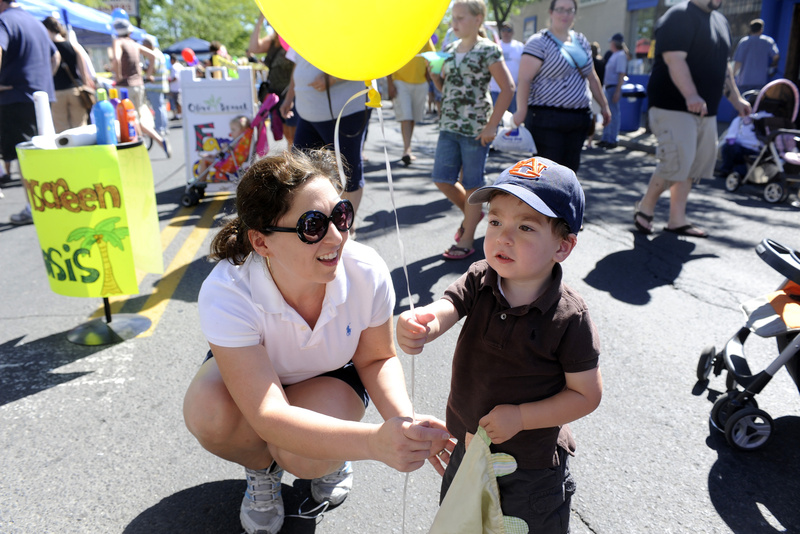 The street fair and block party are designed partly to boost interest in the district’s offerings, Shepherd-Hall said. Some businesses will run sales and promotions. Some will move merchandise onto the street. Organizers say the street fair draws about 10,000 people a year. The fair has boosted walk-through traffic in past years at the shop, where employees this week loaded discounted yarn and fabric onto carts for a sidewalk sale. “This is a slow time of the year for everyone, so it does bring extra people in,” Yochum said. It’ll be M and M Apparel’s first fair. The used-clothing store opened at 635 W. Garland Ave. last year. But Robert Sobeck, who owns the store with his wife, Auna Sobeck, said they heard it’s a good time – and a chance for businesses to draw customers. They’ll stock a booth with clothing and offer sales in the store Saturday. They opened their store after joining a Garland-area church.